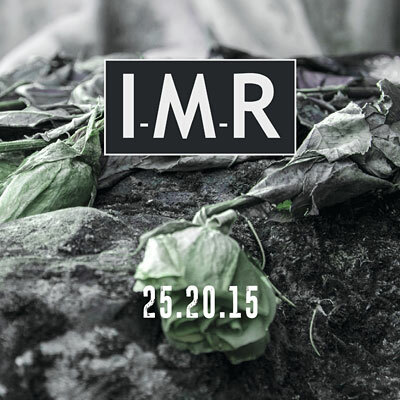 Three years after "InOutSide" I-M-R present their new band album "25.20.15" - and know exactly that purists will have a tough time again. More consistently than ever, Ralf Jesek, Martin von Arndt (PRINTED AT BISMARCK'S DEATH), Holger Diener and Hansi Huenig, pursue that musical concept that was developed in 1992 for In My Rosary and for which a journalist especially invented the genre "DarkWaveFolkPop". Supported by Greek musician KRIISTAL ANN, Russian Darkwave heroes STILLIFE, Ralf's band mates in DERRIÈRE LE MIROIR, Nicole Rellum and Kai Kampmann, as well as the accordeon player Annette Kosakowski, I-M-R illuminate the melancholic romantic terrain between folk, wave, electro and pop with 16 songs. And even if a track sometimes enter a quite surprising realm, they never become disloyal to themselves. Independent in its best sense and certainly somewhat stubborn, that's why "25.20.15" is the logical album within the band's own history.